My colleague Susan and I were privileged to attend last year’s Museum Association conference in Liverpool. We were welcomed outside Liverpool Central Station by a blaze of twinkling lights and the most dazzling Christmas tree. More lights accompanied our walk to our base at the dockland redevelopment, sparkling from the trees, glowing from the big wheel and reflecting in the water. This dockland area is a museum menagerie housing the Merseyside Maritime Museum (which incorporates the International Slavery Museum), Tate Liverpool and the Museum of Liverpool. Our conference was held in the BT Convention Centre, a building shaped like a state-of-the art cauldron and therefore well suited to the fervent brew of ideas, prophesising and conversational hubbub bubbling within. It was great to catch-up with old colleagues and when meeting new ones to compare notes. The Therapeutic Museum examined the role of the museum sector in improving people’s health, wellbeing and happiness. Tomorrow’s World considered how technological developments are changing the museum experience and the skills needed by the museum workforce. The Emotional Museum explored the strong emotional experience felt by museum visitors and how museums should engage with this in order to connect with diverse visitors. The Freedom! Sculpture in the International slavery Museum. The sculpture is made with recycled objects in Haiti. The underlying message of all three themes was that, in order to survive, museums need to meet the needs of their communities. As one speaker said, to start with the heart then work outwards through storytelling to the collections [Christian Lachel, vice president, senior creative director, BRC Imagination Arts, USA Com]. In the session Challenging prejudice and discrimination, it was interesting to hear how Judith Vandervelde, senior educator, at Jewish Museum challenges the preconceptions that some children have about the Jewish faith. She does this by using objects such as Kippah skullcaps with football emblems to build bridges between communities. Also, in this session Alan Rice, Professor in English and American Studies, UCLan argued the case for displaying neglected controversial or offensive objects hidden in stores. They can become valid objects if displayed with the right contextual interpretation. During the Digital democracy session John Ferry, digital and new media manager, Glasgow Museums, promoted the Story Player central content-management system, which can be managed in-house and authored by all staff e.g. curators, marketing and front of house. In the Jodi Awards for accessible and digital culture I was inspired by artist Ticky Lowe’s use of a simple computer called Arduino to produce multi-sensory experiences involving lights, smells and sounds. The bonkers session Collections twister, which involved throwing a huge dice to distribute imaginary objects, also included a not so bonkers plan outlined by Jane Henderson (Senior Lecturer at Cardiff University) to develop a national database for colleagues to share collections and knowledge. This atmosphere of inspirational discourse at the conference was tempered by a spectre at the feast – the museum sector’s funding crisis or challenge, the preferred term of the Arts Council Chairman Peter Bazalgette. It was sobering to hear David Fleming (Director of National Museums Liverpool ) and MA president David Anderson in their speeches, describe the inequalities of funding across the sector between London and the rest of the country and that local councils have cut funding to museums by 11%. The MA plan to campaign against the worsening cuts. David Fleming urged us to ‘Not go quietly into the night’. My pondering how not to do this was answered by the Social Justice Alliance for Museums. You can read their charter for social justice. Helen Goodman (Shadow Minister for Culture, Media and Sport ) also spoke of the funding gap between London and the regions (a disparity of one to 14 in spend) which she asserted could not made up by philanthropy alone. It was encouraging to hear that Labour intended to extend the export deferral period to 30 months to give cultural institutions more time to raise funds and prevent the haemorrhaging of art works abroad. After a wonderful send-off by Liverpool poet, Curtis Watts, we left the conference and joined our train, which was packed with colleagues chatting intensely, quietly musing or just plain stupefied by the intensity of the past days. It had been a really invigorating, interesting and supportive experience. The Brighton History Centre opened in Brighton Museum under the direction of Local Studies Manager, Sally Blann, in October 2003 and formed the final part of Brighton Museum’s refurbishment. During refurbishment, the local studies section had been housed in the former Music Library, now the Cote restaurant on Church Street. We have hundreds of Brighton theatre programmes in the collection. This one is from the Empire Theatre in New Road, which after several changes in name, was demolished in the 1960s. My first impression was one of awe when I saw the size and grandeur of the room. My second thought was, how on earth am I going to remember what stock we have and where it’s stored! Finding material in the early days was quite a hit and miss exercise as we had to work from a card index which was not only out of date but gave no indication of where the material was stored. Over the past few years we have been able to add all Brighton History Centre stock to the museum database. The record includes description, subject and author, for example, but most crucially where exactly the stock was located in the Centre. For the first few years, it was very noticeable how many of the customers were reluctant to access family history data via a computer, preferring to use microfiche: plastic sheets on which the information is stored and can be viewed with magnification. Even when census returns became available online, some customers still preferred to use microfilms. These are notoriously difficult to access as the indexes changed for each census year! By the time of closure, the majority of our customers were using the internet to find the resources they needed. The programme forms part of a fascinating collection of Brighton carnival memorabilia dating from 1922 and 1923. Another noticeable subtle change came in the form we received enquiries. Early on, a large proportion of requests came in letter form but again by 2013, with the increasing use of computers, most were sent by email. Aside from answering telephone, face to face and email enquiries, Brighton History Centre has hosted many visits from schools, universities and community groups and given talks about Brighton’s history. For me, this was the most rewarding part of the job. For example, I created a fictitious family and created a life around them set in Brighton from 1914 to 1965. I thought by telling the history of the city through the eyes of invented characters, the fascinating changes which took place in the city over that period could be related in a far more interesting way. One of the aspects I’ve enjoyed most while working at Brighton History Centre, is the detective work involved when dealing with enquiries. The details that customers sometimes present are not always entirely accurate – sometimes it’s a matter of separating fact from fiction. For example, one enquirer wanted information about a family member who had been Mayor of Brighton in the 1900s – it turned out that the man had been a clerk in the Mayor’s office! This photo represents the quirkier side of 1930s Brighton. In 1932, Braybon’s built a show house on the corner of Prince’s Place and North Street. 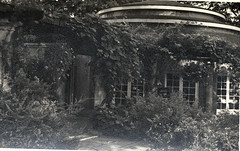 A few years later, the house was later relocated to Hillbrow Road, Withdean where it stands today. Finally, the work would not have been half as pleasurable without the support of the fantastic members of staff who have worked here over the years, most notably Kate and Shona. The following have also helped to create a great working environment: Donna Steele, Christine Morris, Kevin Bacon, Peter Blake, Beverley Green, Karen Archer and Anna Kisby and not forgetting the invaluable help given by casuals such as Jo and Dora Palache.